Mother Theresa is one of my favorite sources of wisdom. I quote her often, along with other great prophets and sages that include Forest Gump, Maya Angelou, my grandmother, Hope Shackelford (my 7th grade English teacher), and, of course — Porky Pig. Across the years, they’ve always come to my rescue when I find myself in need of a few short words to express a powerful thought. The written word must stand alone and communicate everything — precise meaning, “tone” of voice, emotions, level of importance. When you set your words free across cultures and languages, it becomes even more important to choose each of those words wisely, with some care given to the precise message you wish to communicate. Many the marketing team has found their best efforts (and sometimes MILLIONS of dollars wasted to folly) when they discover their “baby” of a product name, their tagline of perfection, does not translate into major world languages and land well. One car company named their new car, did their homework, and woke up to the horror the morning after launch to discover their name meant “broken, cannot be fixed” in a key world language. Of course, my favorite debacle is the sad news that the creative team at Microsoft faced after months of work on BING! (the search engine). They launched it … and the first article headline in retort came back. “BING!?? … Ahhhh …. But It’s Not Google!” Often the written word can stand bare, naked and ugly, glaring off a computer screen or piece of paper, and simply be received as harsh, judging and failing to communicate what the writer intended. The same is true with the universal languages — those that come without much written form. Touch, smiles, hugs, tears, a look that rises from the soul and speaks through the eyes, images that are captured in every form from photographs to hand-drawn crayola pieces of art from the hands of the three-year old child. Who knew? These do communicate across the barriers of culture, language, diversity, space and time. Mother Theresa knew this … each of these are the language of love. And so effective — whether you simply place your hand on a hospice patient while softly saying — I understand …. or hug that child sitting there with the skinned knees, and tear-streaked face, so she knows — the world is a wonderful place to play. Each of these languages express love, compassion and kindness, for they come from the heart and soul of our being and from that we engage. Give yourself a small task today to find just one person you can exercise your universal language “muscle” on. Keep Mother Theresa in your mind’s eye and then step back to watch the ripple effect as that small pebble of love you launch into the pool of life spreads the effect through the world. 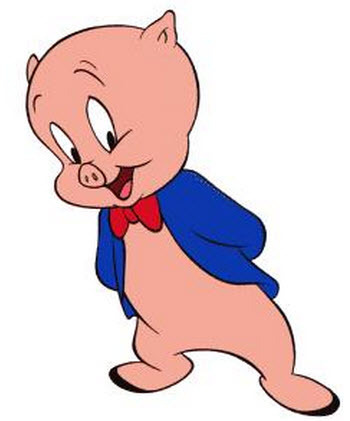 And I bet you are now thinking — “so what’s the wisdom of Porky Pig?” That’s easy … best way in the world to say goodbye for now, and leave a smile. I thought I was “globally minded” when I first started co-creating Tree of Life Celebration. Much to my surprise in the many months since then, I have realized that that I wasn’t as globally minded and acting as I had previously thought. One of the first things I learned was about time zones. While I obviously knew about time zones and sometimes spoke with or emailed people one on one overseas, I found that it’s a different thing when one is posting events for a multitude of people in potentially every time zone in the world. I quickly found out that people in other countries don’t know what PST, CST or EST mean so I had to learn to clarify by not only posting a major city that people might recognize in that zone, but also a time zone converter to empower people to look up the corresponding time in their part of the world…a seemingly small thing yet a big thing when one is coordinating and trying to bring people together for events that require them to all show up at the same time. The other thing that I am learning is just how difficult it can be to truly be globally minded. It really takes more than just a good heart that’s open to cultural differences. I have found that I didn’t realize how grounded I was in the sense of being a Westerner that has a tendency to think primarily from a Western hemisphere perspective. I am fortunate because people have spoken English in most of the places I’ve traveled in North America, the Caribbean and Europe. When posting articles or messages, it’s not hard for me to think of including language translations like Spanish and French since our Canadian friends often speak French and many of our neighbors to the south speak Spanish. It’s not even that much of a stretch to consider our European friends and some of the languages they speak…but even that isn’t global. What about the Asian, Russian and Arabic languages on the other side of the world? Now that begins to stretch me really far! If one has a message of unity, how does one communicate across all of these languages? Yes, we have the great tool in Google translator but I have also learned that while it may be able to translate the larger aspects of language but often it totally misses the mark when it comes to subtlety and nuance, especially when it comes to things of a heartfelt, spiritual nature. And then there are the cultural differences. I have just gotten to the point where I feel I can communicate clearly and authentically in English. I am grateful when I am able to communicate in English with people in other countries who often speak/write 2-4 languages, but now I find that it’s not enough to just speak the same language; I now need to potentially consider how the words I speak might be received from another cultural perspective…like haleyheart mentions above. It feels almost like going from 2 dimensional thinking to holographic thinking. I didn’t realize my brain was so flat before. Meanwhile, I believe that the language of the heart translates into any language, especially when in physical space together. In the midst of a language barrier of words, one can still see light in the eyes or feel the gentle, caring touch across seeming cultural differences. Love and tenderness is understood by all even across the plant and animal kingdom. Maybe humanity would find that they experience less divisiveness if they would just stop talking for awhile and experience one another through the other senses. It seems that maybe the words are what’s getting in the way of us be-ing one with each other. I’m off to stretch myself some more as I better learn how to be a loving, considerate global citizen. Wish me luck and send me good energy.